Recent news reports have indicated that fall is the season for spiders. Maybe the spiders in Emporia, Kansas, heard that forecast because just this last week, two were discovered, photographed, and killed. 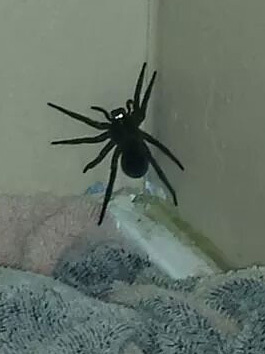 Can you name this spider? On a sunny morning three days ago, I stepped outside and found this gold and black beauty beside my front door. It was spinning a thick web that glistened in the sun. I shuddered as I thought of how my skin would feel if I walked into those sticky strands, and I wondered what venom the spider’s bite might carry. As beautiful as he was, he had to die because I was afraid of him. He could be poisonous, and I wasn’t willing to take a chance, so in the end, he was the one that was poisoned. The second spider wasn’t so beautiful, and it wasn’t spinning its web in the sunlight. It was in a far more frightening place: on the wall above my granddaughter’s bed. There was never a doubt that this spider had to die. 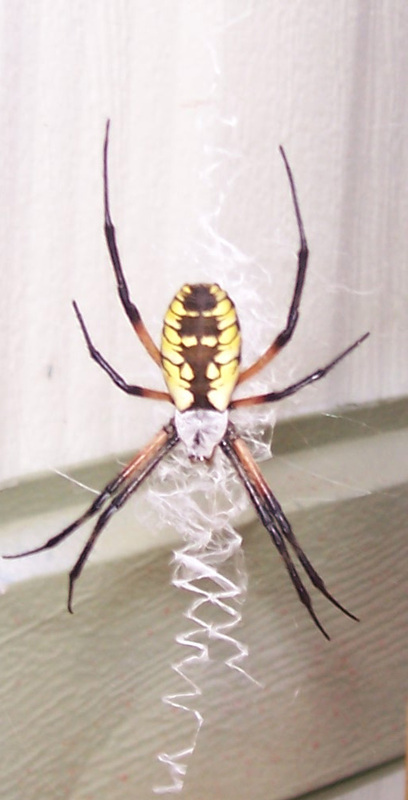 Did these spiders deserve the death penalty? What do you do when you see a spider? This entry was posted in Nature and tagged spiders. Bookmark the permalink.